Bought Micromax Canvas Nitro? Need help? Confused about which is the best way to root? We are here to help you root your Canvas Nitro. 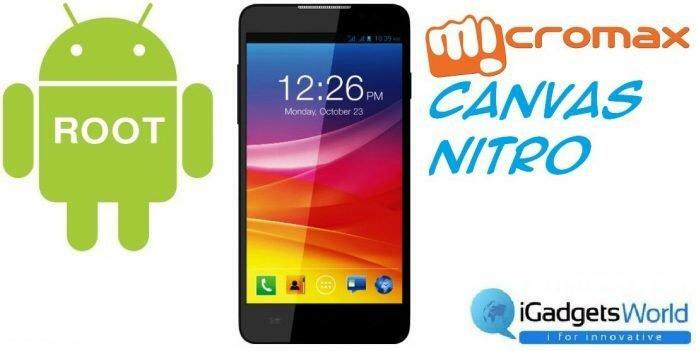 Micromax Canvas Nitro A130 was recently launched by Micromax. It is quite a good device packed up with an awesome combination of Android Kitkat and great hardware specifications. Before proceeding ahead I’ll like to point out that Rooting voids Warranty. Rooting is a confusing process for all new users, but by following up the guide below you can successfully and easily root you Micromax Canvas Nitro. Our Android devices can do a lot of wonderful and awesome things, but for doing them all we need a basic magic know as ROOT. Rooting is a process which helps us to gain administrative access which is further required by specially written apps to perform up their specific mods. Read More : Know more about Canvas Nitro, a tough competitor of Moto G.
Most of the people think that Rooting will damage up their device and they will lose up the warranty of their device, yes it is true that one will lose up the warranty, but then you can flash the STOCK ROM anytime and get your device as it was on the first boot. Also I’ll like to inform up that Rooting alone won’t do wonders, but it will help you in doing the wonders by giving you Superuser access. So before proceeding ahead here are some few goodies that you need to download. And make sure your device has at least 75% + and you have enabled USB Debugging, if not, go to Settings>About phone>tap the build number 4-5 times and that will enable Developer Settings in case it is not present by default. 1) Download and install Kingoroot on your PC. 2) Connect up your device to PC via USB Cable. NOTE:- Your device may take up some time to connect. 3) Click on the root button. 4) Wait for sometime and your Canvas Nitro will be rooted. If you still have queries about it write them up in the comment section below, we will try to respond to your queries as soon as possible. Know more about Canvas Nitro, a tough competitor of Moto G.